I’ve been thinking about characters and their appearances in preparation for the “Characters in Costume” blogfest for the end of October, and I’ve also been reading some of the classic Disney stories to my two sons. As a result, I’ve been thinking about the way Cinderella’s stepsisters come across in the books and film. Anastasia and Drisella deserve a lot of adjectives: mean, harsh, thoughtless, selfish, and self-absorbed, to say nothing of petty and unobservant. But what makes them ugly? 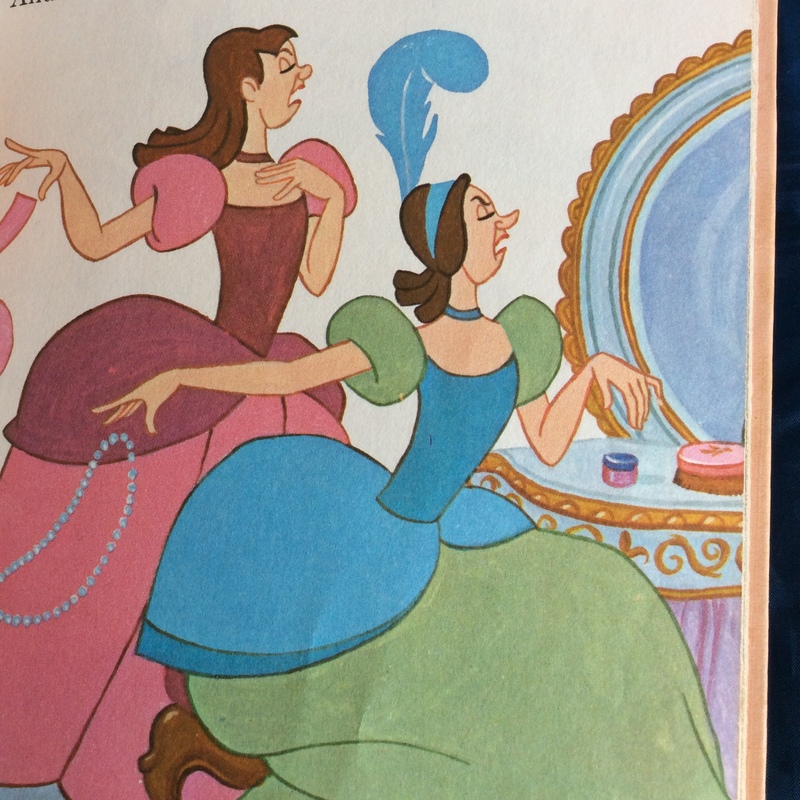 Being a children’s book, the story relies on illustrations rather than a great deal of description, but other than the sneers on the girls’ faces, I don’t see why they must be ugly. They both seem to have poise and even grace–note the way their fingers move when throwing away the unwanted finery in the above picture. They certainly haven’t outgrown the awkward stage of stumbling and dashing about, but at the same time, their mother hasn’t done much to give them self-confidence in their own beauty and capabilities. They are only as good as their putting down of another makes them, which would do nothing to improve any natural elegance they possess. As for physical blemishes, they lack the curves of Cinderella. They lack her cloud of blonde hair, instead having tight ringlets of brown or auburn. They have a snub nose or a long, prominent one instead of her pert, artistic shape. Everything about them, in comparison to Cinderella, is larger, though they don’t seem to be much taller. Their mouths are bigger, eyebrows more prominent. They are broader of limb and foot than Cinderella, and their costumes tend to enhance their physical disadvantages. But I don’t know that such would make them ugly. Less idealized, certainly. Less “womanly” as the media depicts such things, absolutely. But if anything, they are more typical, more realistic. I don’t know that having anyone in an “ugly” category could ever come off well, since it’s there would always be someone who would be slighted, whether he or she was depicted as short or tall, thin or broad, dark or light. Even such relatively grotesque creatures as one-eyed cyclops or snake-haired medusas could be relatable in some form or fashion (in movement or mannerism), and thus offend someone, but in this case, I really think Disney didn’t think their choices through. 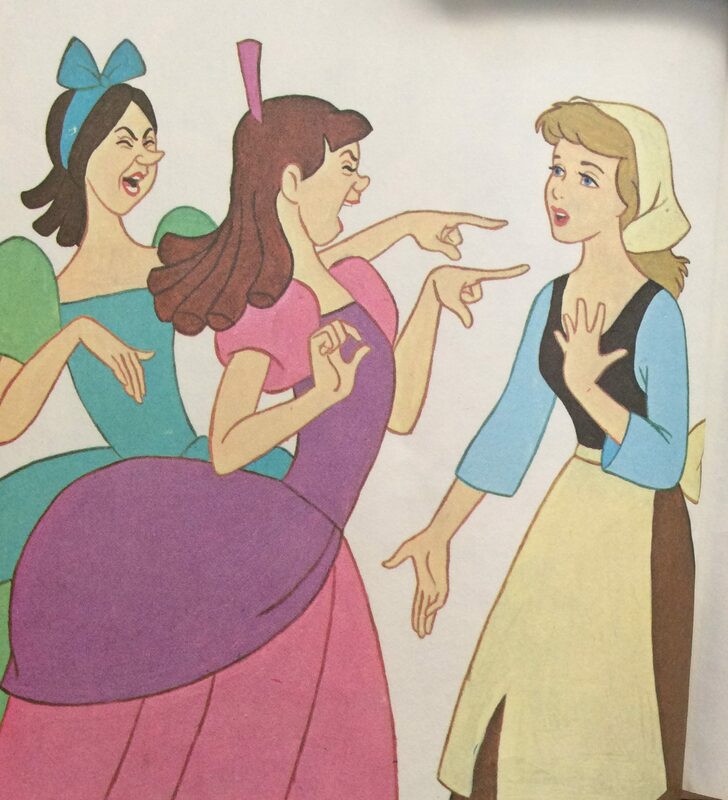 They needed the stepsisters to be part of the antagonistic trio against Cinderalla; good and well. They wanted some sidekicks to the main villain; fine. Draw them as you wish, and describe them however. Just don’t call them ugly. If you have a character from fiction or film whose appearance you’re longing to discuss, join us by signing up for the “Characters in Costume” blogfest. We look forward to reading your thoughts and opinions! When I hear “ugly step-sisters” my first impulse is to think of ugly in terms of who they are rather than their actual appearance. I’ve known worldly beauties whom I could never see as beautiful because they were so unattractive on the inside. Likewise I’ve known many comely people whose inner light made them incredibly beautiful in spite of their physical characteristics. That makes sense. But I can’t help but wonder if kids think that way or if some of the outside “packaging” gets included. I know I’ve never felt my “big feet” were attractive, and I wonder that media stereotypes and scenes like the stepsisters attempting to fit the shoe add to this struggle.